Live the Beach Life DIRECTLY on the Gulf of Mexico. You can't get any closer to the World famous St Pete Beach than this! You will enjoy Sunset views every night. 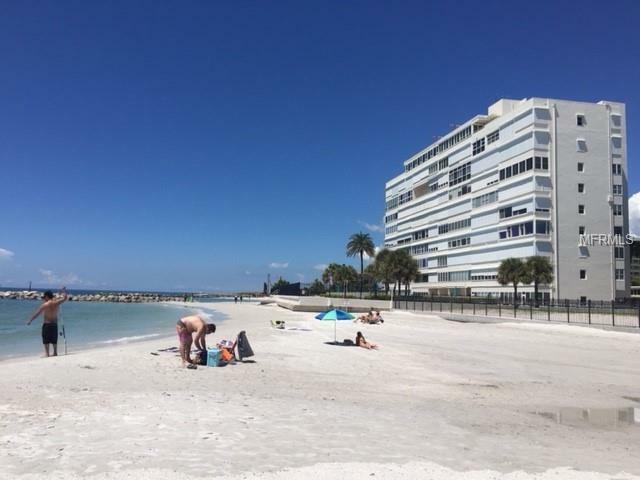 Large one bedroom/one bath 4th floor apartment with 28 feet directly on the Gulf of Mexico. Huge windows provide a light and airy feeling while maximizing your view. Open floor plan with a view of the water from every room. Storm Shutters to protect your apartment when you are not there. Extra large heated pool is perfect for morning exercise or just relaxing. Enjoy morning walks on the beach while watching the dolphins swim in the Gulf. Numerous restaurants and the shops of Corey Ave are just a short walk away. If you have family/guests visiting, building has a guest unit that can be rented at a very reasonable rate.